A friend recently told me about a puzzle, which is a great excuse to explore programming craft. in Alloy, to try a declarative approach. A trivial solution meeting these constraints would be to consider each leg as a separate route — but that would require a lot of planes. The puzzle is to find a partitioning with the fewest possible routes. In this example, we know we need at least two routes, since there are two legs scheduled on Tuesday. One possible solution is for one plane to fly PDX, SEA, DEN, PDX, DEN, JFK and a second plane to fly just the Tuesday PDX to SFO leg. If you want to try your hand at this puzzle yourself, you can try this 10,000 leg data set. When I first encounter a new problem, I try to wrap my head around it by first trying the simplest thing that could work. This helps me get a handle on the problem, and lets me test my understanding of the fundamentals before I start to worry about things like the efficiency of the calculation, optimality of the solution, etc. I started with Clojure, since that language makes it easy to interactively “sketch” with little bits of code. The simplest way I could think of to find a partitioning (not necessarily an optimal one) was to consider the legs on each day of the week, starting with Monday. On Monday, no routes will be in progress, so we’ll need to create a new route (that is, assign a new plane) for each Monday leg. Then we repeat this for each day of the week. Calling add-legs multiple times looks awkward in hindsight, but the development process that led to it felt quite natural: While writing the code, I manually evaluated Monday to verify the “base case” behavior, then Monday and Tuesday to verify the “adding a leg” behavior, and once confident that the results were correct I simply added on the rest of the week to come to the full solution. I struggled with whether I wanted the reduce to be over the day’s legs or over the set of existing routes. I chose the legs so that it’d be easy to ensure all of them were assigned. Clojure’s immutability sometimes feels awkward. E.g., to extend a route with a leg, I wrote: (-> routes (disj r) (conj (conj r l))), meaning: Given the set routes, remove the route r, then add the route r extended with l, (conj r l). Interestingly, (update routes r conj l) doesn’t work — apparently update only works for maps, not sets. Again, I didn’t expect this algorithm to be optimal (to partition with the minimal number of routes). To get a rough sense of the “optimality”, I updated the algorithm to randomly choose between the available legs (i.e., within the reducing function I replaced first with a nil-punning rand-nth). Then each run of the function will likely yield a different legal partitioning. Interestingly, the dozen solutions I “sampled” in this way all had the same number of routes. This doesn’t mean it’s optimal, but it’s suggestive. For the second pass, I punted again on the optimality question in favor of writing a faster implementation of the same algorithm. The outer loop goes through the days of the week, and the inner loop goes thorough the available legs for that day of the week. This solution also finds 2414 routes, but in just 23 ± 1 ms (about a thousandth the time of the first solution). Not bad. This is a lot more code than the first solution and probably more difficult to follow (I wrote those comments for myself while implementing, not for this writeup). The inner loop result destructuring feels awkward, but was the best I could do within the context of immutable data structures. While the number of routes found is the same as the first attempt, the returned routes themselves are different. This is an artifact of how the underlying data structures work: In the first algorithm, the route that’s extended by a given leg depends on the arbitrary iteration order of Clojure’s set implementation; in the second, the most recently seen route at a given location is the one that’s extended, since conj adds to the front of lists. For fun, I thought I’d also solve the problem with Alloy, a verification tool based on first order relational logic. One fun aspect of Alloy is that it isn’t like a typical programming language that merely processes some provided data. Rather, Alloy will generate instances of data that conform to the constraints that you give it. 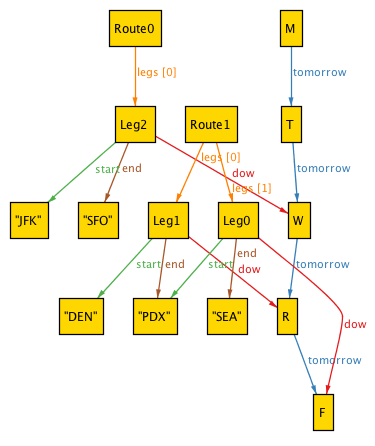 Leg.start + Leg.end = "PDX" + "DEN" + "SEA" + "SFO" + "JFK"
Here Alloy has generated two routes (a Wednesday JFK->SFO route and a Thursday/Friday DEN->PDX->SEA route) that satisfy the general constraints of the problem, as well as the cityNames constraint that those cities must all appear. and then found a satisfying instance with Alloy. Alloy worked great for this example with 6 legs. Beyond the graphical and tabular output, it will interactively allow you to click through to see all possible solutions. 19440 vars. 545 primary vars. 47792 clauses. 262ms. and it certainly feels like 19,440 vars is more than the problem actually has. Perhaps things would be faster if the constraints could be rewritten without Alloy “sequences” (which are just sugar for an Int -> T relation)? It’s fun to keep just-complicated-enough problems like this in my back pocket, since they make for worthwhile exercises to try out different languages/techniques. Mutable data structures in Clojure, both to explore clarity and performance. Maybe Java queues? Parallelism?